Well, I missed the Teddy Bear's Picnic on Thursday. I had to take our little two year old for a visit with her parents - hasn't seen them for 5 months as they keep cancelling visits. This one was to be an assessment as the order runs out very soon. I don't normally drive her there and back - one of the workers does. But as that worker was going to be away it meant she would have to go with a stranger. Just seemed too hard to ask - a stranger taking her to see people she hasn't seen for 5 months and then a few months before that!! Lots to do before I went to make sure that everyone got to where they needed to go in the afternoon. Hopefully this week's Teddy Bear's Picnic I will be more organised. Friday was spent at the new shop of Homespun and Beautiful. It was so lovely to be back surrounded by all that wonderful fabric. I worked on Beatrice Bear by Debbie Magee - love her dolls. I have a pile of her patterns on the to do list. Saw the lovely dolls that Tereasa has made - Love Notes by Debbie Magee - one is for the shop and one is for the Beaudesert Quilters Biggest Morning Tea to raise funds for cancer research. Worth going just to get a ticket and be in the running to win the doll. Not to mention the good cause all funds are going to! Friday night was the "Friday Night Sew In" but before that started I had to get my daughter organised for the first Debutante Ball of the year. Our district has two. I used to organise one of them for 26 years - only gave up 2 years ago. My daughter was flower girl when she was 7. She loves dancing. So even though I wasn't going, she wanted to go with one of her friends. My nieces look after them - they think it's great, so grown up. So we were curling hair and getting organised. I've got the photos on my camera and not my phone - so that will be a later blog!! Lots of work to do, but she's taking shape! 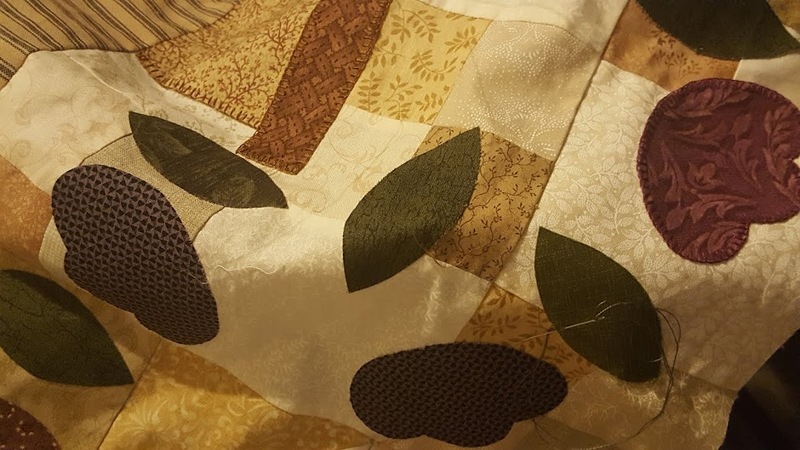 I also worked on one of my Christmas Quilts - it's all put together but needs some more stitching. Mostly just headings for each block. This is in my finishing list for this year. It's a possibility. Saturday morning the oldest son needed to be in Landsborough at a Scout course by 8am (that's about a 2 hour drive north from here). Daughter needed to be at Canungra at a Scout course by 8.30am - that's about 30 minutes from here but east and not north. 2 sons had to be at Gold Coast by 9.30am for Rugby - about 1 hour - possible to do Canungra and Gold Coast, but not Landsborough as well. So the eldest son found a lift but we had to be at the Gold Coast by 5.45am for him to get the lift. That meant daughter going with friends to Canungra (DH still not driving because of pains in chest!!). So Rugby boys and eldest set off at 5.00am for the Gold Coast. We met the lift and had some brekkie. I sewed until Rugby time. Rugby game was going well and almost half way through. Been getting some photos for their scrapbooks when one of the boys from the other team seemed to twist around to take the ball in the other direction and down he went. He was screaming. Not sure what he did to his leg, but it was painful. Because they couldn't move him until the paramedics arrived, they had to abandon the game. Then back to Canungra to meet up with daughter. Found out that the day there had ended early and she was already back home. Then to Youth Group and then back to Gold Coast to pick up eldest son. I've finished the quilt top, so not sure what I'm going to do with this one, but maybe a small wall hanging. My second son had friends around for a belated birthday celebration. They just amused themselves with DVDs and Hungry Jacks for dinner. Yesterday - thankfully - was spent at home. I even got a little more done on my Christmas Quilt and also some of the clothes for Beatrice have been cut out. This morning my daughter had to be at school by 6.00am to get a lift to go to a Netball Carnival. She'll be back about 5pm. Oldest Son has a meeting at the Gold Coast tonight. So there'll be a few sewing opportunities throughout the day. One of the things I have to get organised on is the costumes for Rock Eisteddford. My second son is dancing in that and there are lots of costumes to be made. I've taken a fairly simple set that just involves overlocking but in many different sizes. Patterns need to be cut out today!! More blogging later. Oh Marg, you have such a busy life and you still manage to fit in lovely sewing. Well done. Goodness me I got worn out just reading your post. You certainly deserved some time out for stitching. Debbie Magees designs are just beautiful. I have to find time to go out to Tess' shop!!! Thanks so much for linking to Tuesday Treasures. I think you are the Treasure for all the help you give to dear children. OMG what a busy lady you are it sent my head spinning just reading about it,lol. You are one very busy lady , how do you ever find even a minute to sew , simply amazing!